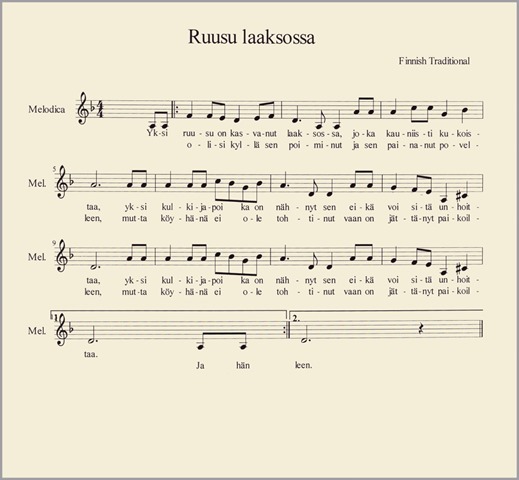 One Rose in the Valley (Ruusu laaksossa) is a Finnish folksong which has been popular as long as I remember and it was popular in my mother’s and grandmother’s time. When I started to translate it I saw one very interesting thing. I have always thought it is the rose that flourishes nicely but the grammatical correlate is the valley (laakso) not the rose. And more I think about it the more it makes sense as in Finland we don’t have year-round vagabonds because they froze to death during the winter but we had men who worked at farms in summer and in the woods in winter (logging sites). These men were usually poor and most likely they didn’t feel at home in the prosperous farm houses. Perhaps words are just as they supposed to be in the first place even though I and some of my friends thought otherwise. (I asked my friends, whether it is the rose that prosperously flourishes or the valley, and they have also been thinking it is the rose.) Nevertheless it is the rose that young man wanted to have and hold against his breast but being just a poor young man he didn’t dare to ask the hand of the daughter. Note: The valley is the best place for the fields because water ends up there and it is safe from wind and cold. The farm hand men have been history for decades. I hope you like this song as much as I liked to work with it. but left it in (its) place. As you can see this story is a bit obscure and there might be as many interpretations as there are listeners, and them all are valuable and correct. My translation based on presumption that the rose is a daughter of the prosperous farmhouse and the boy is a farm hand. This song is at least 200 hundred years old and then it wasn’t desirable that a poor man proposes to the daughter of the (rich) farm owner. In fact at that time the poor men weren’t popular suitors anywhere. It was their burden not the barrier of picking up a rose (a real flower) in the valley. Well, I might be wrong all the same. Roses of life to everyone. This entry was posted in Literature, Music, Nature, Poetry, Society, Visual Arts. Bookmark the permalink. What a shame the young farm hand didn’t risk picking it and offering it to the young girl.Maybe she liked him too. It’s a lovely little song. I agree with you it’s sad that our young man didn’t do an initiative. Thank you. My pleasure. Have a nice weekend. Thank you very much for commenting. I am happy that the song appeals to you. It’s a beautiful song and I love your interpretation that the rose is the daughter of the rich farm owner. Often these traditional songs are symbolic, which is why they are so deep and resonant. Thank you for commenting. I agree with you that the charm of this song, as well many other traditional songs, is in enigmatic. 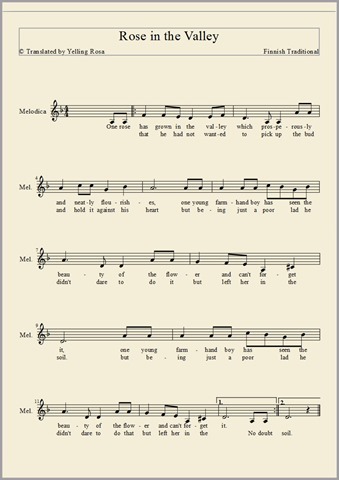 Words in song has a double meaning. You have to delve deeper to truly understand the meaning of the song. and to translate? that will be very difficult because you cannot translate word by word. Hence, the way you ‘translated’ the song is correct. By the way, I love the title and the story of the song.Thank you for sharing something from your country. It is exactly word by word translation excepting two spots. In the first line of the second stanza I have used word “surely” and in Finnish version the word is “yes”, which doesn’t make sense in English. In the last line of the second stanza I have added the word “its” but it is in the brackets to make it looks an extra word. Please feel free to make up your own picture about the meaning of the song. I see the message the way I have told. I do not know Finnish but the English text is really superb. Compliments! Thank you very much for giving me so kind words. I agree with you that this little song is the miracle maker. You are absolutely correct, there are so many interpretations and nuances that can be gained…and would be appropriate…in those words. Truly amazing poetry…like Shakespearean sonnets…and Biblical scripture…so rich, alive, and full of meaning. Thank you for your nice and warm words full of humanity. ¡Gracias, Yelling! Muy lindo… 🙂 ¡Un abrazo! Miraba un video del Trío Vocal, agradable cantando. Roses of life – I like that. Thank you! That’s a beautiful and thought-provoking lyric. Thanks for translating. Thank you for commenting. To be, or not to be? That is the question … but likely. La tua ricerca è molto precisa e interessante. Anche in italia vi sono canzoni il cui passato è ambiguo e difficile da identificare come tra l’altro Bella ciao. Grazie per il commento e la rosa. Canzoni popolari sono simbolici, come hai scritto. Thank you for nice words. I am happy to make you feel fine. I actually remember this song very well from my childhood. Beautiful! Oh I loved this! Thank you for sharing it. The song touched my heart and made it open up, almost like a rose 🙂 I truly appreciated this song and your sharing about the translation. Thanks again. I am happy that the song appeals to you. Sad but sweet ditty. The poor boy shd have taken a ‘stab’ at it. Perhaps, the girl would’ve accepted him. Thanks for sharing. I think it is a good work! Very good work, Rosa!